I managed to get my hands on a ticket for TEDxBelfast before they were all snapped up and here’s my take on what turned out to be a fantastic night. David spoke on the ever increasing number of people across the world- including the UK, who are slipping into fuel poverty ie people who cannot afford to heat their homes. His idea is that if we can design out the need for central heating then we remove the largest outgoing for families leading to better lives and more disposable income. His approach seemed to be based on a conventional build so that the construction industry would not have to retrain and that additional planning permission would not need to be sought. I would have liked to have seen some diagrams or models on how this will work but I look forward to the day when I don’t have oil bills. Fransuer spoke on the differences of children in developing countries who dare to dream of becoming doctors, nurses etc even though the probability of this happening is very small, compared to children here who on the face of it seem to have forgotten how to dream as the opportunities are readily available. What children here want is an opportunity to be themselves as in this crazy world we are in danger of losing ourselves. Fransuer’s organisation is all about realising that as individuals we can’t change the world but what we can do is to change the world for an individual. Hopefully some day I’ll have the chance to do that for someone. Colleen spoke on her website placespeak.com, an attempt to address the massive disconnect between the general public and the politicians who are meant to represent us. Part of the problem is with consultations- face to face meetings either have poor turnout or people with agendas, while online consultations often get taken over by trolls as the responses are anonymous. Placespeak.com uses various methods of authenticating users to their geographical location so that the politicians know that they can trust the responses coming back to them without knowing exactly who or where that person lives. Although the site seems only to have taken off in Vancouver so far it would be great to see what could be achieved if it was adopted here in Northern Ireland. Chris spoke of his work in Musical Theopy for children with Autism and he explained that the occasions where he got the best results is when he gave control of the session over to the child and Chris did his best just to accompany them in what they were doing eg playing notes in time to a child drumming on a tabletop. Sometimes in live we just need to listen to the people around us and watch for those non verbal cues that they are giving out rather than trying to control or lead every situation. Colin spoke of fear and that fear isn’t something that we are born with but something that we learn along our journey. Living in Northern Ireland our history is full of fear so our collective identity is also one of fear and negativity. Chris spoke of the creative industries that are now starting to blossom in Northern Ireland and that if we can keep on producing the people, ideas and products that have made NI a world leader in the past, we will continue to do so in the future. Chris spoke of the Science Gallery in Dublin – a space where science becomes active and the exhibits become an art form. In conjunction with Trinity College the exhibits are fully interactive and are manned by PHD students who explain the science behind the everyday world. This greatly improves the communication skills of the students and the visitors get a real sense of just how exciting science can be. The project has been so successful that individual exhibits are now touring other museums around the world and that Google have donated money to help set up Science Gallerys in other cities again in conjunction with local universities. My impression of the evening was of an overwhelming success. The speakers were well informed, motivational and gave insights into topics that even though I am doing different things I can apply in my own life. 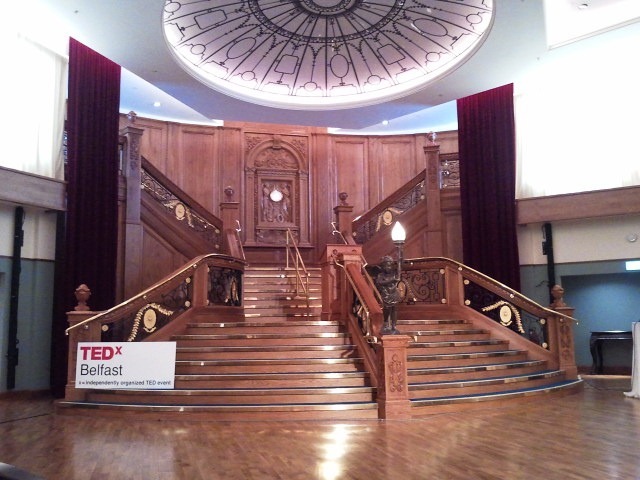 The event was held in the Belfast Titanic Centre and was a brilliant venue for such an engaging conference. I eagerly await the next TEDxBelfast. Next Next post: Is Document Management Boring?